Brooklyn Center is losing a brick-and-mortar retail option. 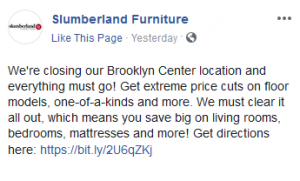 Slumberland Furniture announced its closing its clearance store on Earle Brown Drive. The Little Canada-based furniture retailer posted the announcement on its Facebook page. Slumberland faced increased competition, as a Hom Furniture opened just over a half mile away. The company has two other northwest metro locations, a store in Maple Grove and another at Ridgedale in Minnetonka.